Celebrate July 4th on the seas with your family this year and book your tickets on board the Audubon Yacht. This NYC July 4th cruise is going to treat you to a night out that you won’t forget. Enjoy views of the city as you celebrate this year and the perfect ending to your night. Check out what this NYC July 4th cruise will treat you and your family to and make your way on board! The Audubon Yacht is going to treat you and your family to amazing views of the city skyline as you celebrate your Fourth of July. Enjoy views of the Empire State Building, the Freedom Tower, and more! Watch as your family enjoys the sights of the city like they’ve never experienced. Party with your family to the sounds of a live DJ as they mix and spin this year’s Top 40, Pop, Hip-Hop, and Dance hits. Move your body on the dance. Keep the drinks pouring with your four-hour premium open bar and enjoy drinks all the way until the fireworks begin. This NYC July 4th cruise is going to sail you around the city until the Macy’s Fireworks launch into the night sky. Once the fireworks begin, you and your family will enjoy a front row seat to the show. Watch as each firework paints the night sky with vivid colors and beautiful patterns right from the Audubon Yacht! Where else would you want to celebrate July 4th with your family this year? 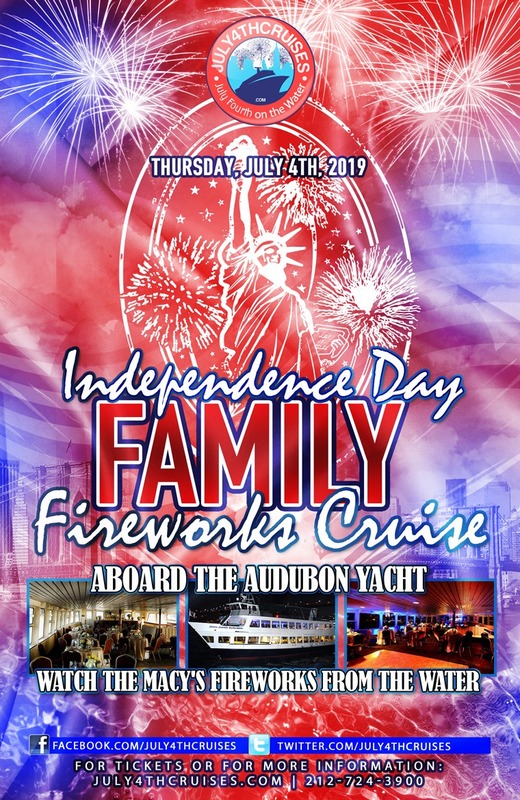 If you’re not celebrating on board this NYC July 4th cruise on the Audubon Yacht then you’ll definitely be missing out! Celebrate with us this year and enjoy an amazing and unforgettable July 4th on our NYC July 4th cruise that you’ll be talking about for years to come.